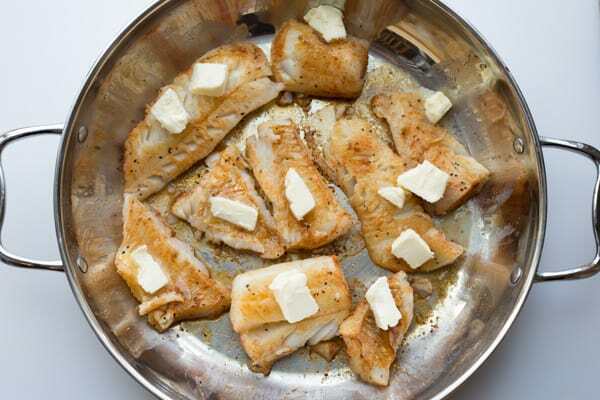 A simple and quick recipe for Buttered Cod in Skillet. Seasoned cod fillets in butter, herbs and lemon. The amazing recipe is ready from start to finish in under 10 minutes, perfect for a lazy dinner. Enjoy the fish with a side of mashed potatoes. Cod in a Wine Sauce is another easy way to prepare cod. This truly is the best recipe for cod. The fish become so flavorful, flakey and melts in your mouth tender. The butter penetrates into the cod and combined with the seasonings, lemon and herbs is a phenomenal recipe. This is the easiest recipe for cod fillets in a skillet you will find. You are going to love the recipe and prepare it over and over again. Even your picky eaters will approve and ask for seconds. Prepare seasonings for the cod. Combine the ground paprika, salt, pepper and garlic powder. 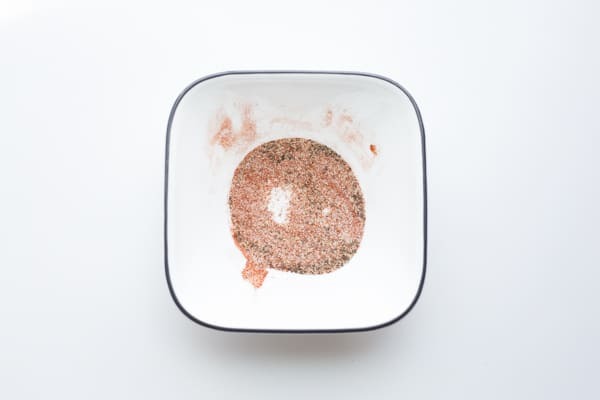 TIP: If you like spicy food, add ground cayenne pepper or chili, to taste. Heat 2 Tbsp butter in a wide skillet over medium-high heat. Add cod to the melted butter in skillet. Cook 2 minutes. Turn heat down to medium. Turn cod over, top with remaining butter and cook another 3-4 minutes. 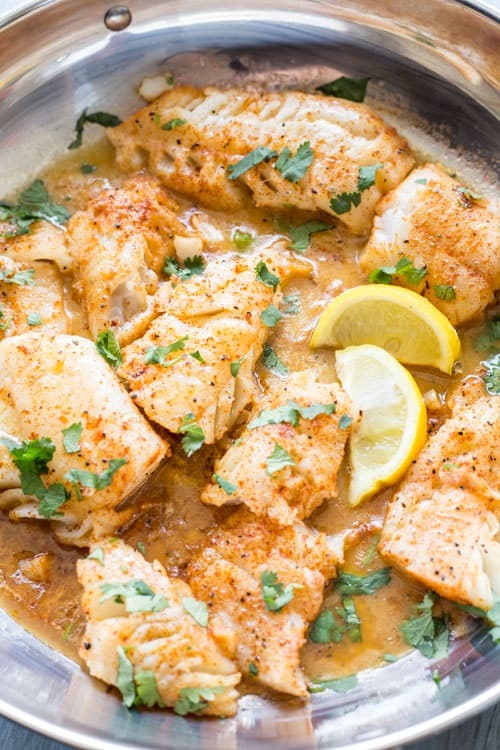 Drizzle lemon juice over cod and top with fresh cilantro or parsley. NOTE: Butter will completely melt and fish will cook through. Don’t overcook, it will become mushy and completely fall apart. What kind of Cod do I use for Buttered Cod in Skillet? You can use any cod fillet. An Alaskan or wild caught cod will perform best in this recipe, however, your favorite cod fish will work. How long do you cook Cod Fish? The thickness of the cod fillet will impact the cooking time of the fish. A thicker and larger fillet will require a few more minutes of cooking time. A thinner fillet will cook quicker. Can I use frozen Cod? Yes, store bought frozen cod will work. Just be sure to completely thaw the cod fillets before cooking. Thaw the cod in the refrigerator. I hope you this seasoned Cod in creamy butter, herbs and lemon. Such a simple dinner with wonderful results. WOW your guests and family alike. Flounder with Vegetables– This quick recipe in a skillet is a must try. Tilapia– Popular for a good reason, SOO GOOD! Baked Salmon with Asparagus– Oven baked and so quick. 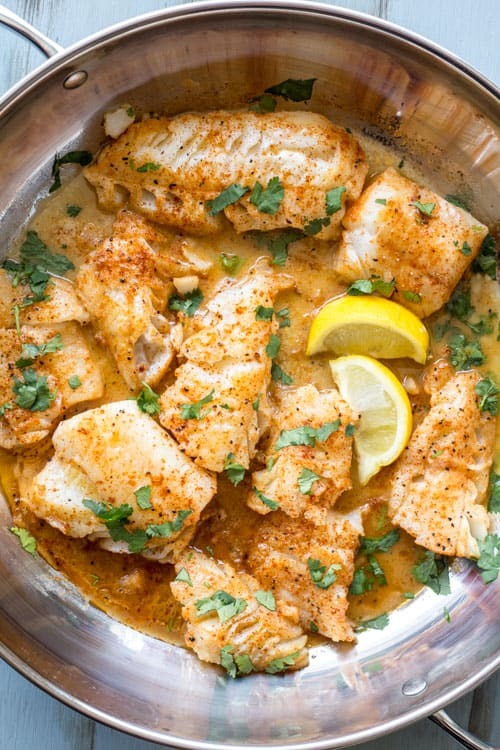 Amazing, quick and easy recipe for buttered cod in skillet. Ready in 10 minutes, this fish recipe has a wow factor. 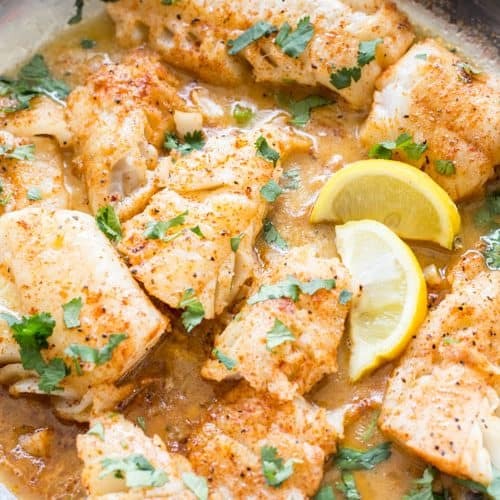 The seasoned cod cooked in butter and topped with herbs and lemon juice is amazing. Stir together ingredients for seasoning in a small bowl. Cut cod into smaller pieces, if desired. Season all sides of the cod with the seasoning. Heat 2 Tbsp butter in a large skillet over medium-high heat. Once butter melts, add cod to skillet. Cook 2 minutes. Drizzle cod with fresh lemon juice. Top with fresh herbs, if desired. Serve immediately. Made this tonite. It was DELICIOUS! Best Cod recipe that I’ve ever made. Thanks for sharing. Thank you for the feedback, Irene. I’m so glad you enjoyed the cod recipe. 🙂 Come back and visit our online home again. My family LOVED the cod. The family wished there was more made. ? It will definitely be served again and again and again. I did start cooking the cod frozen, so it took a bit longer than you’re directions, but it still turned out fabulous! All the ingredients were on hand. I served it with roasted garlic mashed cauliflower (to go with the Keto Diet), sauteed onions and hot peppers, and french cut green beans for the family. Thank you for a great recipe! ?? Umm, have you followed the instructions? What do you do with the parsley or cilantro? Hi, Sly. 🙂 As the video shows and per instructions, you add the parsley when serving for added flavors and appeal (this is optional). Enjoy. Thank you so much for sharing this recipe! We LOVED it! I used half the butter, as we are looking for healthy alternatives compared to battered and fried cod. Definitely a new addition to my recipes! THANKS! Great spices and instructions. Seriously it is delicious with a quarter of the butter. Thanks! My brother and I are always looking for new and easy recipes to try. Ran across this one and have to tell you we both fell in love with it. I think it took us less than 10 minutes to get it on the table. We served it with biriyani. It was amazing! We will be making this again and having friends and family over to share with them! This recipe is so easy and absolutely Delicious! My whole family loves it; even my daughter who doesn’t really care for fish. Thank you so much for sharing it with us. Makes me smile huge, Christine. Thanks so much for sharing your feedback.